PM Narendra Modi inaugurates new BJP headquarters in Delhi - Integration Through Media ....! 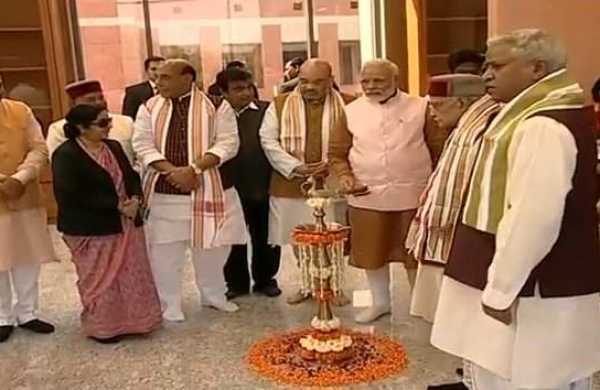 NEW DELHI: Prime Minister Narendra Modi on Sunday inaugurated the BJP's new headquarters here at 6, Deen Dayal Upadhyaya Marg, in the presence of veteran leaders like L.K. Advani and Murli Manohar Joshi. Equipped with modern facilities, the headquarters' foundation stone was laid by Modi on August 18, 2016. It was constructed in a record time of one-and-half years. With the inauguration, the Bharatiya Janata Party became the first major national party to shift its office outside the Lutyens' Bungalow Zone, following a Supreme Court directive that party offices should be relocated from there. He said that the Jan Sangh and BJP leaders have been at the forefront of all leading mass movements after Independence. “Ours is a party committed to Rashtra Bhakti. In thought, in action and in implementation, the BJP's core is truly democratic,” the Prime Minister added.